Former Manchester City defender Danny Mills believes manager Roberto Mancini could be sacked if his side suffer an FA Cup exit against Leeds on Sunday. City trail Premier League leaders Manchester United by 12 points and were knocked out of Europe before Christmas. "Mancini is under pressure," said Mills. "It looks like they have blown their chances of retaining the title. "You wonder what would happen if they went out of the FA Cup against Leeds. 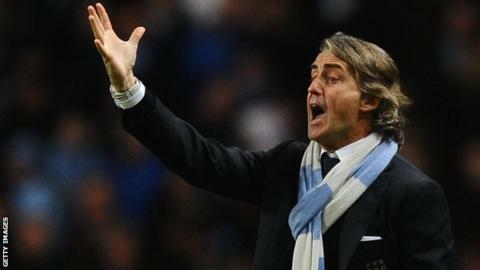 I think Roberto Mancini goes." City were crowned English league champions for the first time in 44 years under Mancini's leadership last season, but face an uphill battle to prevent neighbours United regaining the title. The Blues suffered a shock 3-1 loss at Southampton last Saturday and United beat Everton the following day to open up a commanding lead at the top of the Premier League. Now Mancini turns his attention to an FA Cup fifth-round tie against Championship side Leeds at Etihad Stadium on Sunday. "Manchester United's 12-point lead is too much," Mills told BBC Sport. "I think Mancini will go in the summer anyway if they don't win the league. "But, if they go out of the FA Cup at this stage, I could see the owners making a decision sooner than that." Ex-England international Mills made 54 appearances for City between 2004 and 2009. The FA Cup represents City's final opportunity to win a knockout competition after their League Cup exit in November was swiftly followed by Champions League elimination. City failed to win any of their matches against Real Madrid, Borussia Dortmund or Ajax and missed out on a consolation spot in the Europa League as they finished bottom of Group D.
"There's a rumbling undercurrent of discontent at City," claimed ex-England international Mills, 35. "From the outside it all looks pretty and serene, but underneath there's a bubbling inferno ready to explode. "They have brought in Txiki Begiristain and the owners seem intent on creating this Barcelona model. They want success and that means Mancini is under a fair bit of pressure, especially after they failed miserably in the Champions League."